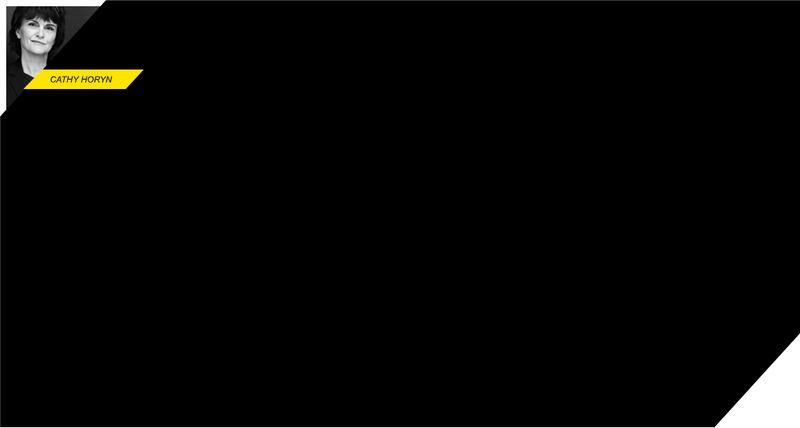 analysis October 7, 2015 10:10 a.m.
Will Balenciaga’s New Creative Director Be Even More Commercial Than Alexander Wang? What Demna Gvasalia's appointment means for the brand. What Demna Gvasalia’s appointment means for the brand. Balenciaga has a new creative director: Demna Gvasalia, the Georgian-born, 34-year-old founder of the Paris label Vetements. Gvasalia comes to Balenciaga with experience: a master’s degree from the Royal Academy of Fine Art in Antwerp, a stint at Maison Margiela (after Margiela himself had retired), and a year or so as a senior designer at Louis Vuitton. His first show for Balenciaga, owned by the Kering group, will be next March. 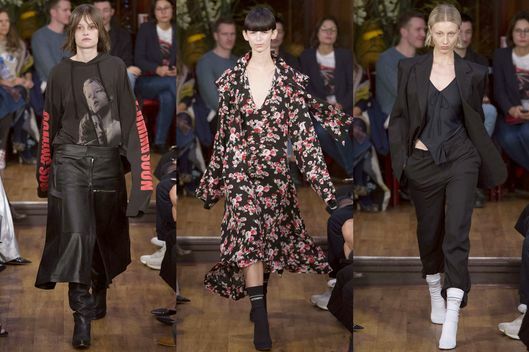 Vetements, now in its fourth season, has caused a stir in Paris and in retail, with its repurposed vintage jeans (a single pair, made out of three pairs, sells for about $1,400) and oversize hoodies and T-shirts. Its shows are small, clubby, intense, with an ad-hoc feeling not unlike early Margiela shows. “We felt the energy was missing in Paris,” Gvasalia said by way of explaining the brand’s approach when I stopped by Vetements’ garagelike showroom yesterday to see his clothes up close. 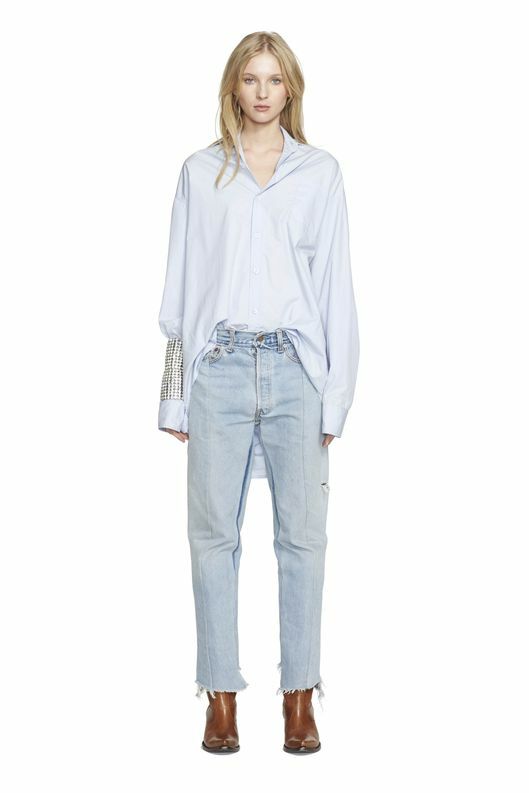 Vetements repurposed vintage jeans, made out of three pairs, sell for about $1,400. Photo: Studio N SoHo/&#xA9;2015 NORDSTROM, Inc.
Gvasalia maintained a perfect poker face about Balenciaga, denying he was succeeding Alexander Wang. “This brand takes all my time,” he said of Vetements, which he runs with his brother, Guram, as a business manager, and a small team. But after a moment Gvasalia did ask if I could see him at Balenciaga, and reluctantly I told him it could be an interesting experience for him, especially given the Balenciaga archive and his evident passion for breaking down a garment. And Nicolas Ghesquière, who initially revitalized Balenciaga, had started with cool street clothes — remember his batwing tops and skinny trousers, followed by his popular cargo pants? His experimental stuff came later. Of course, Margiela’s vision was really a long-term project, and not something that flickered with the seasons. It remains to be seen if Gvasalia can make a project out of Balenciaga, as Miuccia Prada does with her own label, or Ghesquière has done at Louis Vuitton in a fairly short time. One thing that will be interesting to watch is how feminine Gvasalia can make Balenciaga. 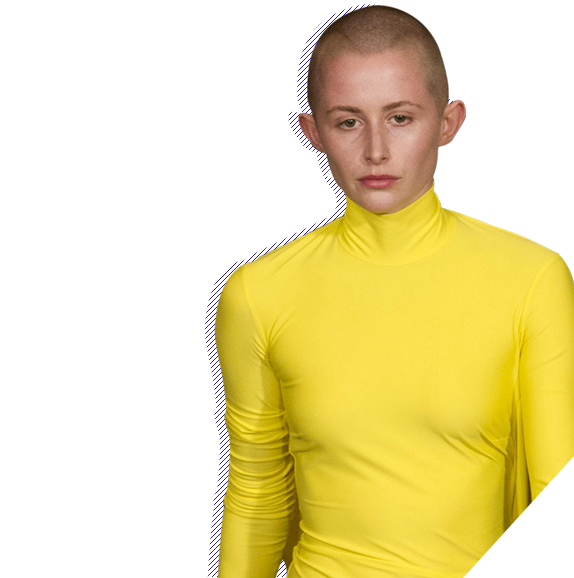 Vetements is quite a masculine label. His team’s goal, he said, is to “break the typical femininity,” and create styles that you can just slip on and wear, like Vetements’ new frilled-yoke dresses in jersey. Accordingly, they fit their samples on both models and normal bodies to achieve a more natural, unfemmy attitude. While Balenciaga's femininity isn't romantic, like Dior's, it does have a history of extreme volumes and austere lines. Even now, we still associate the house with the '50s images of Penn and Avedon. And there's Cristóbal Balenciaga's Spanish heritage to explore, which includes the Catholic Church. Ghesquière did street-inspired clothes when he worked there, but he really got into the very structured pieces from the archive and made new interpretations. Wang left a very mixed "legacy" during his three years. In a way, Demna has a clean slate to rebrand Balenciaga.